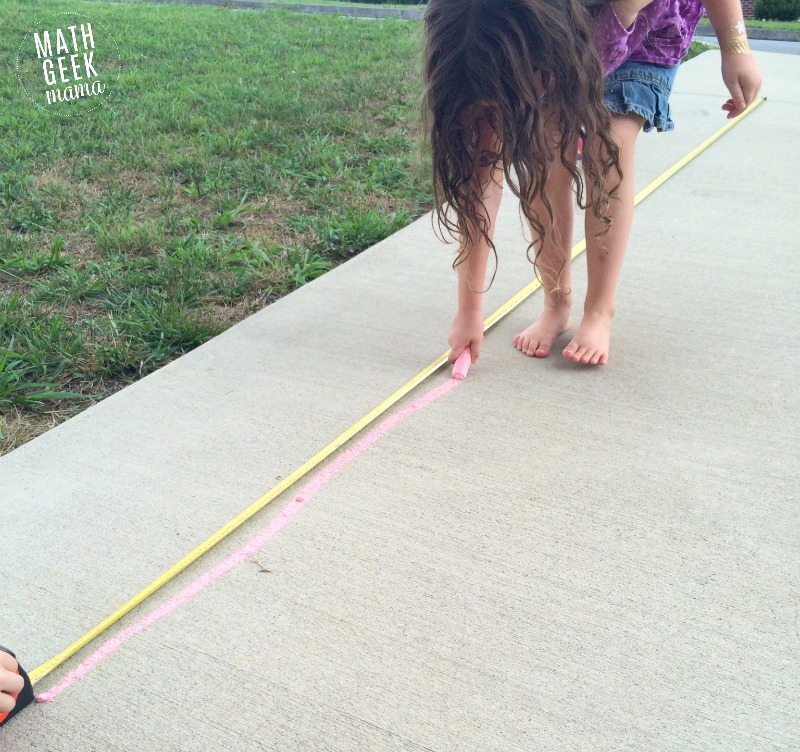 Measuring is one of those early math skills that is incredibly important to learn and practice. It must be precise if you are hanging something on the wall, or building something, or needing dimensions. 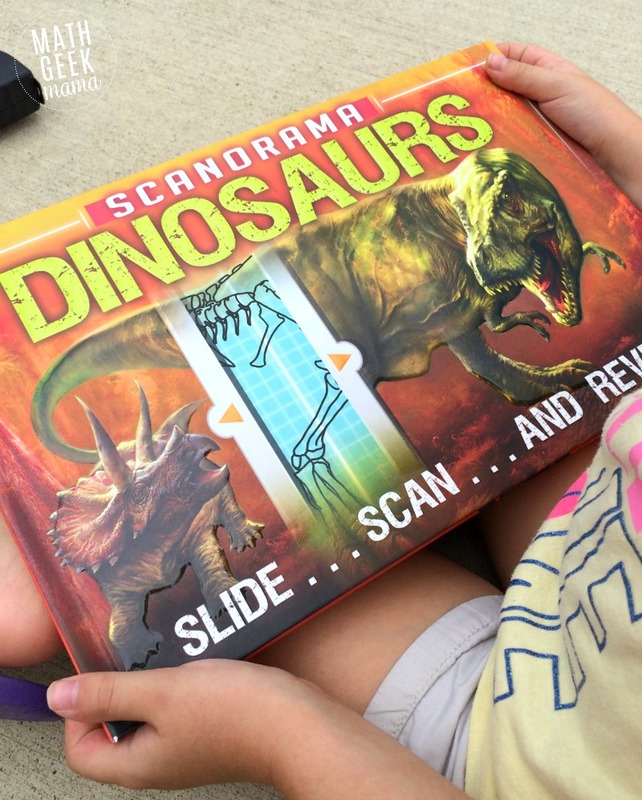 Recently we were given a Scanorama science book to review, and I used it as a springboard for a fun, hands on measuring activity with my kids! After receiving the book, I left it out for the kids to discover, look through and read on their own. This piqued their interest and they began asking to read it together. My older two would also share fun facts they learned about certain dinosaurs. Eventually, we sat down to explore the book together to search for answers to some of their questions. I also showed them the slides and we compared the bones and their sizes. 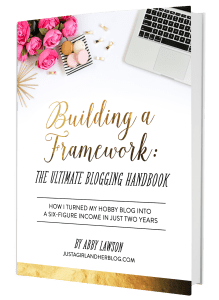 This book is SO packed with information, it definitely requires more than one read through! 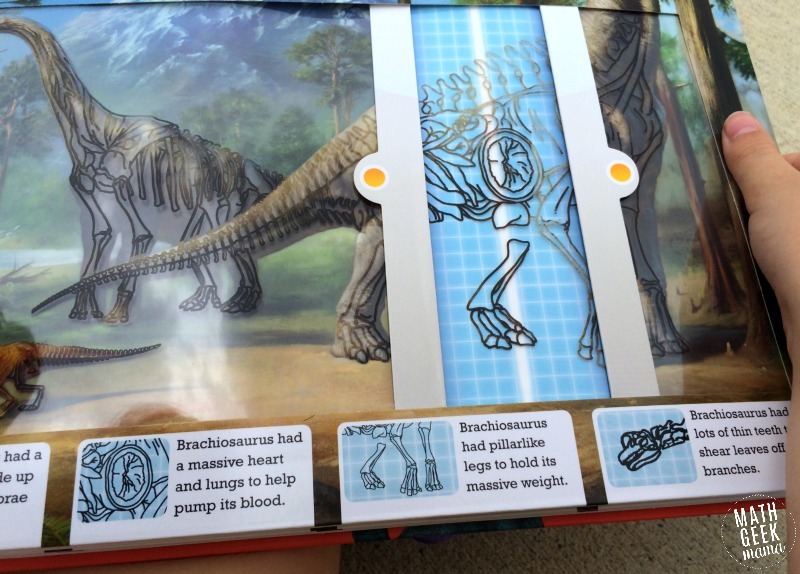 So after we read and compared the different dinosaurs, I pointed out the various sizes of some of their favorites. Did you know that a Tyrannosaurus Rex would be anywhere from 33 to 43 feet long and had the largest teeth of any land dinosaur? Because this book is organized so nicely by type of dinosaur, we were able to compare and contrast the different types by size. As we considered just how large some of these great animals were, however, it because clear that these numbers are difficult for young kids to comprehend. A Diplodocus is 80-100 feet long? Sounds big, but just how big is it? So rather than just reading about the sizes of dinosaurs, we decided to actually measure them and compare! 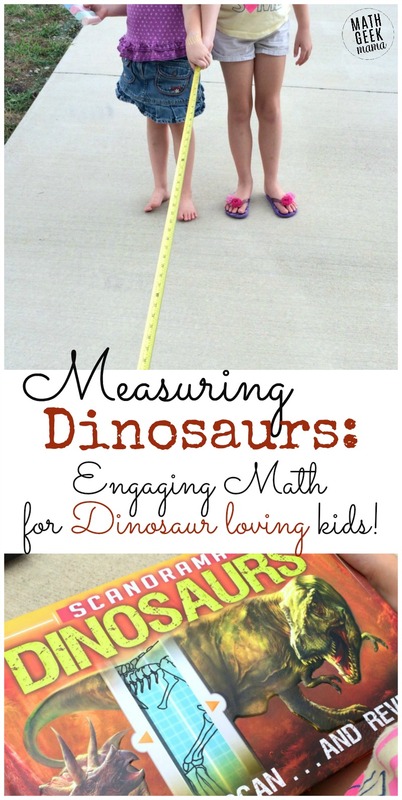 Once you’ve gathered the materials, just decide which dinosaurs to measure! We decided to measure the bone-headed dinosaurs first. 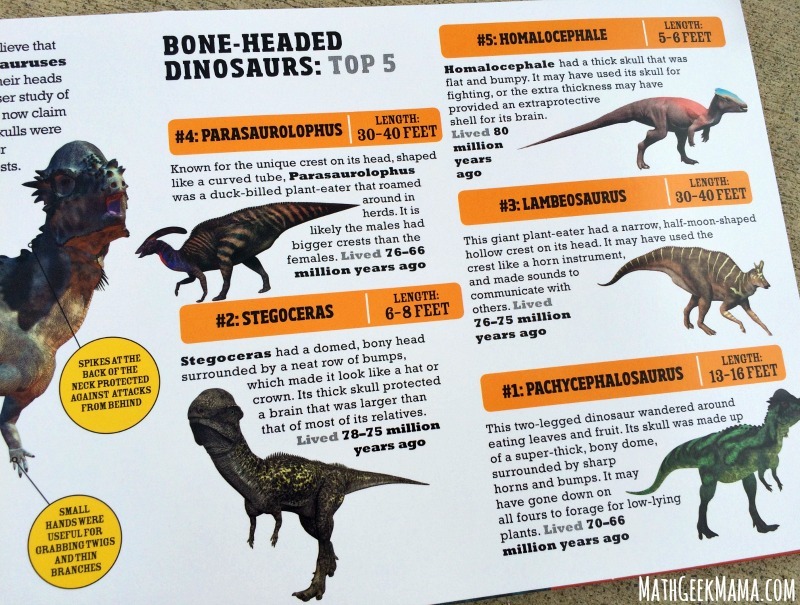 Each page offers the “top 5” of that particular type of dinosaur. It then gives a brief description of the animal, including the length. Because the length is given as a range, we measured the smaller number in the range. I would then explain that this dinosaur was at least this long, maybe longer. You could use the larger value, just be sure to be consistent. For instance, don’t measure the smaller value of the range for some dinosaurs, but the upper value for others. To compare all five bone-headed dinosaurs, we started our measuring tape at the same place on our driveway for each dinosaur. Then, I simply held it while my kids pulled out the measuring tape to the right length. 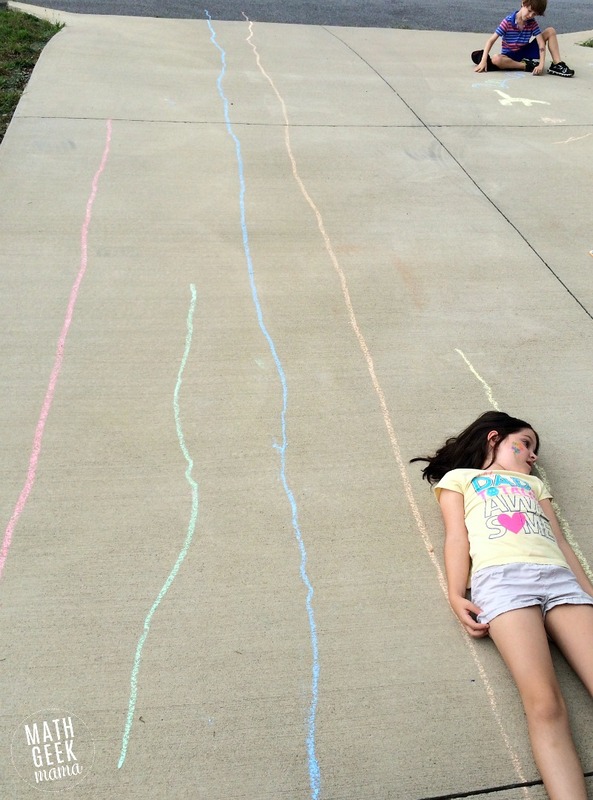 Finally, a child who was not measuring would draw a line with chalk to show the length of the dinosaur. I also challenged my daughter (second grade) to calculate how much longer the dinosaurs were than her. 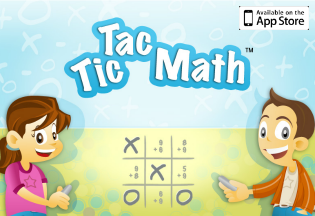 This was a great mental math exercise. We also saw that two of the dinosaurs were about the same size. The longest of the bone-headed dinosaurs was approximately 30 feet. When my kids saw how long that is, they marveled at how big the dinosaurs must have been. At this point, I brought their attention to the long-necked dinosaurs. Some of these dinosaurs were 100 feet long (or longer!). Again, understanding the incredible size of these giants is hard for any of us to imagine, so we decided to measure out 100 feet. This was another great opportunity to put their math skills to work. 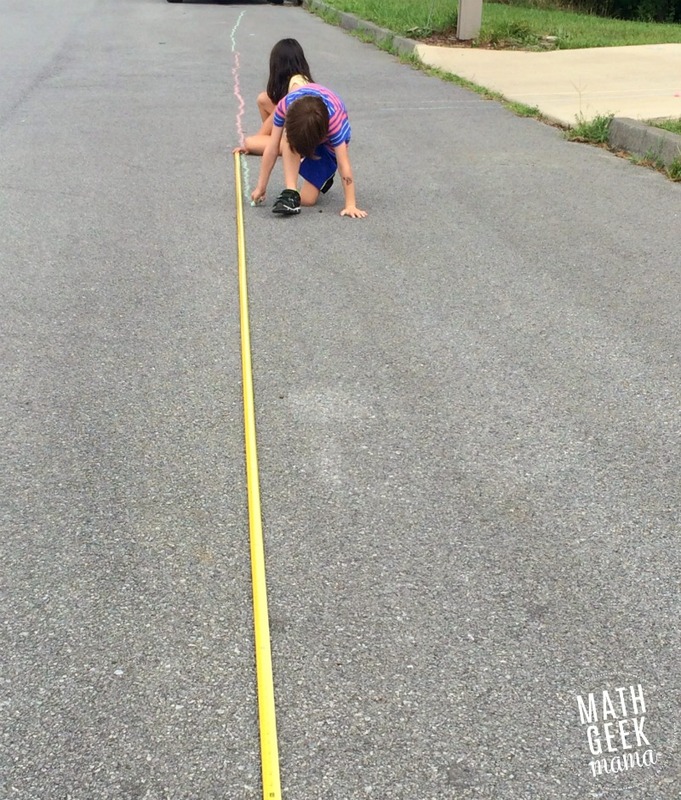 Because not only did they have to measure out 100 feet, they had to figure out how to get to 100 feet. Our measuring tape only goes to 25 feet. This gave us the opportunity to talk about money and how many quarters are in a dollar, as well as fractions. 25 is one fourth of 100. So you have to measure 25 4 times to get to 100. 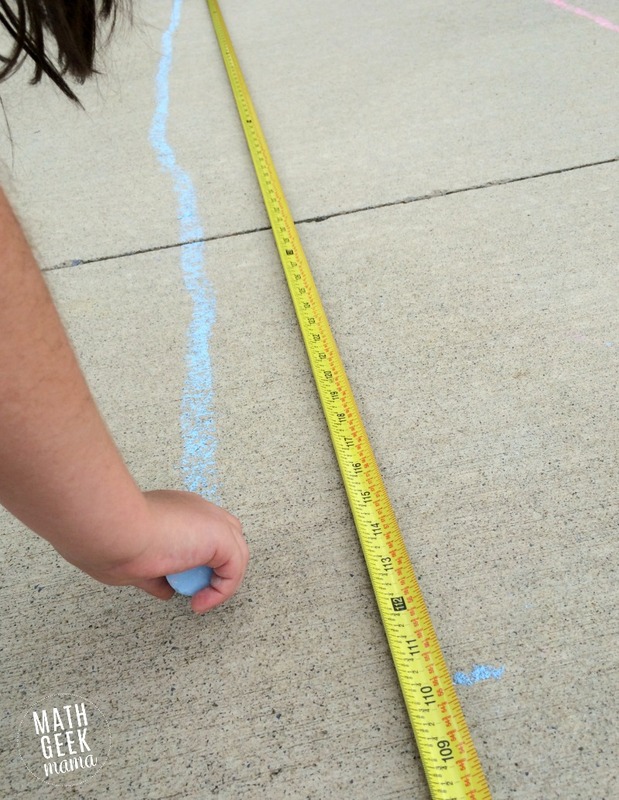 This also meant we had to measure in the road (our driveway is definitely not 100 feet long). So if you don’t live on a quiet road away from cars like we do, you may need to find somewhere else to do this activity. 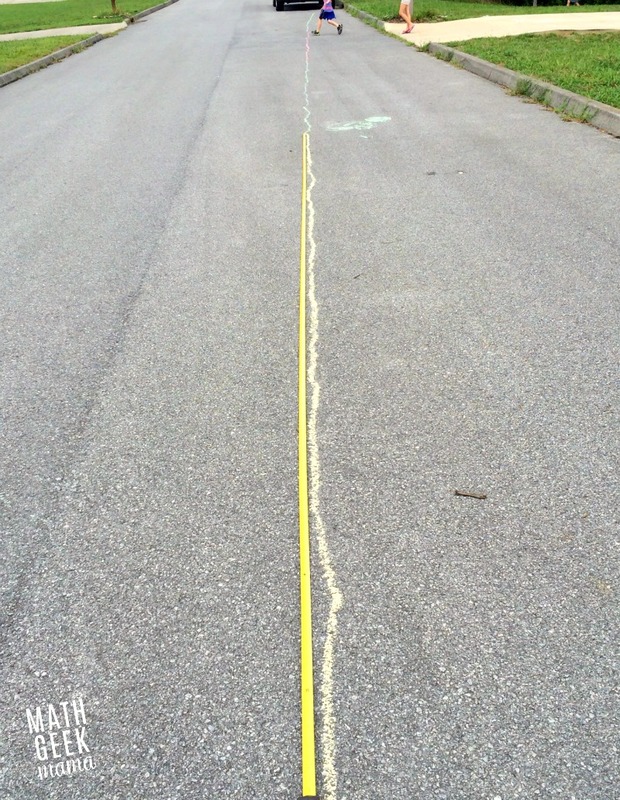 My kids took turns measuring and drawing lines with chalk until we had a 100 foot chalk line going down our street. It was so fun to stand at either end and picture just how big the Supersaurus would have been! It was really a fun way to help them understand length, measuring and comparing numbers. What ideas would you add to this list? Share in the comments! When I first heard the concept of the book (with an x-ray scanner), it sounded like great fun, but I was incredibly skeptical. It sounded like something that would get destroyed in my house full of small children (including a not so gentle 3 year old). However, I am so very impressed with the quality of this book! It is very sturdy, and nothing has been ripped or broken. Even though all 4 of my kids have been looking at it and using the slides to scan the pages. In addition, the pages are gorgeous lay flat pages full of cool images and lift-the-flap pictures. It would be hard to fully enjoy and experience the book without the lay-flat pages. Finally, as I’ve mentioned, this book is packed with information. 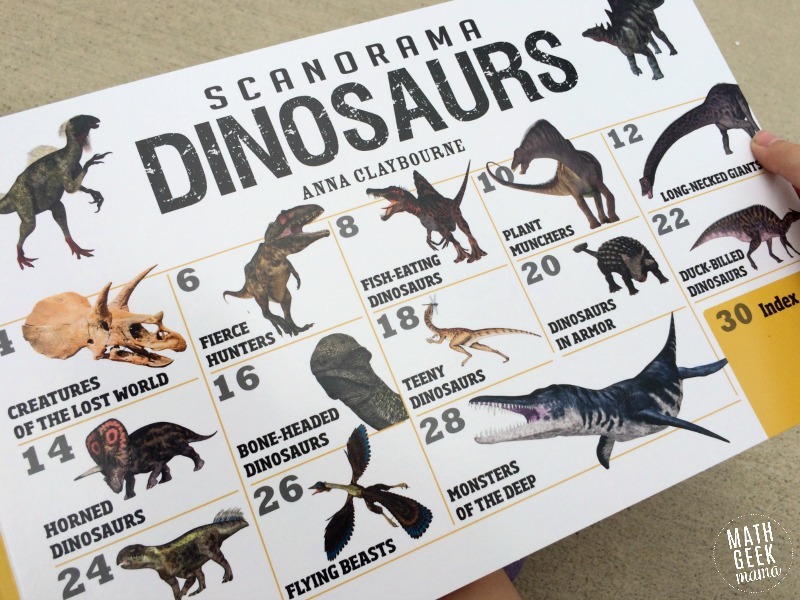 So if you have a dinosaur loving kiddo, this will not disappoint. There’s so much there, my kids often discover something new each time they read through it. 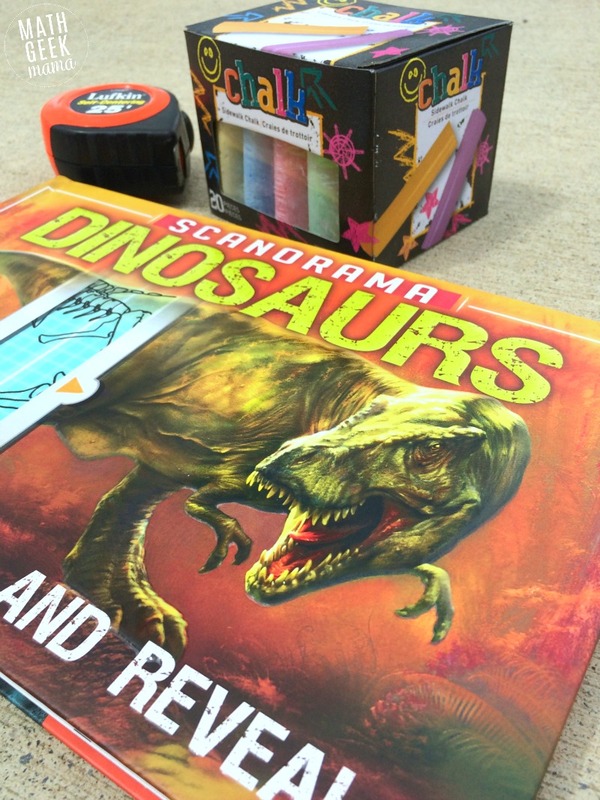 And if your kids aren’t into dinosaurs, there are other great Scanorama animal books to explore, such as Scanorama: Amazing Animals and Scanorama: Deadly Predators. 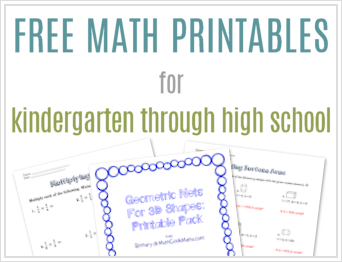 Looking for more fun, hands on measuring activities for kids? Try one of these! Want to take your measurement lessons a step further? 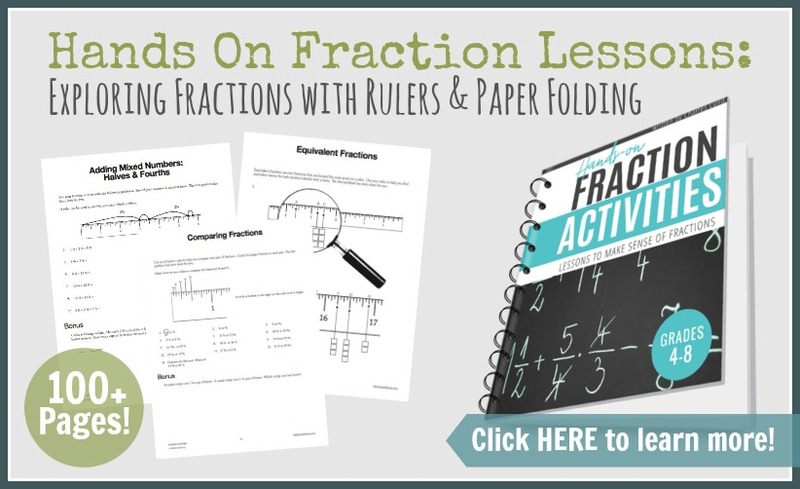 Explore fractions with rulers! This is a great visual model for all kinds of fraction concepts!